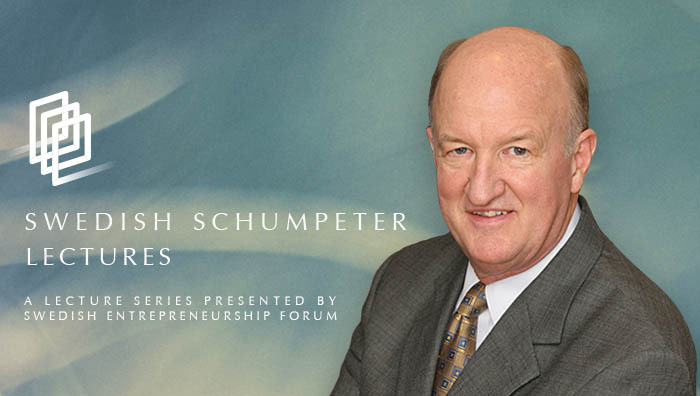 On October 3 Swedish Entrepreneurship Forum organizes Swedish Schumpeter Lecture 2017. This year’s lecturer is Dr. Mark Skousen. He is famous for advancing GO – Gross Output as a complementary measure to GDP. GO shows fluctuations in business investment and can predict changes in GDP in as much as 12 weeks in advance. Unlike the GDP measure, GO is focusing on the supply side of the economy, thus demonstrating entrepreneurs ‘ sensitivity to cyclical fluctuations. Based on Skousen’s work the US Bureau of Economic Analysis now publish GO quarterly data along with GDP data. Mark Skousen is a presidential fellow at Chapman University in California. He has taught at Columbia Business School and is a former financial analyst for the Central Intelligence Agency, CIA. His PhD in Economics is from George Washington University. Mark Skousen is the author of over 25 books, including The Structure of Production and The Making of Modern Economics. He was recently identified as one of the world’s most influential living economists. Comments from Pontus Braunerhjelm, Research Director Swedish Entrepreneurship Forum and Professor Royal Institute of Technology, KTH (moderator), Erika Färnstrand Damsgaard, Head of division, Macroeconomic research, The National Institute of Economic Research (NIER), Lena Hagman, Chief Economist Almega and Johan Eklund, CEO Swedish Entrepreneurship forum and professor Blekinge Institute of Technology. Time: Tuesday 3 October, 15.30–17 followed by a mingle session. Coffee and registration from 15.00.